No elevation chart because Zdenek did an alternate around this section last year. It was near freezing temps when I got up to get the bear hung food bags this morning. I had to put on my damp rain gear to walk through the brush to go get it. I wore my flip flops to avoid putting on the wet shoes and that was pretty ridiculous since my feet got wet anyway. What a way to wake up! To make matters worse the hanging rope was somehow not budging and was wedged in the branch. I messed with it til my hands got too cold and E ended up climbing the tree again to get them down. Whew, by the time we got going, it was 6:45am and 35F/1.7C. Both of us were quite cold and the brush was the thickest and wettest yet in the first mile of our hiking this morning. With already wet rain gear, it quickly started to seep through and it was NOT enjoyable. I would have taken photos if 1) My hands were dry enough to even hold my camera. 2) my hands were warm enough to function. My hands were so cold I couldn’t even grasp a zipper if I wanted. We could see the sun hitting the far valley wall as it was rising. We hiked fast to stay warm knowing the warmth of sunlight was nearing. The old forestry road varied from a wall of brush to sparse brush along the side and improved as we hiked. 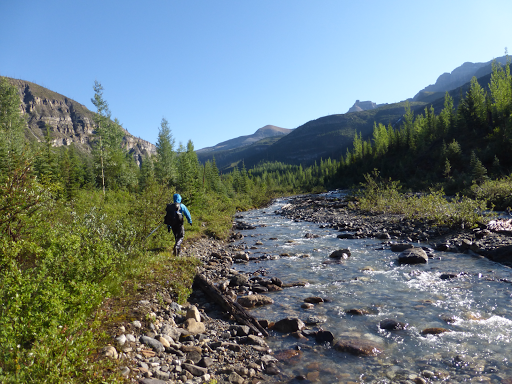 We also had three crossings of the Amiskwi River, but with the low snow and water year, they were pretty simple. After two hours, we hit sunlight! 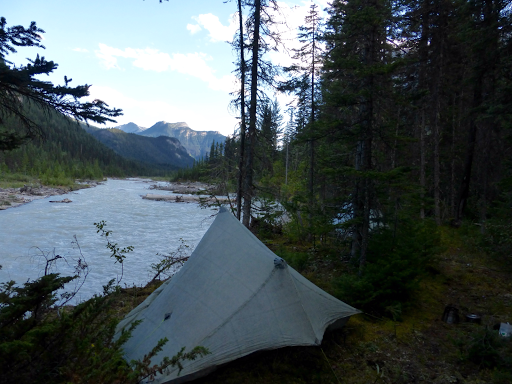 We took a break along the Amiskwi River for an hour to warm up and dry things out. It was still not even 50F/10C, but it was so much warmer than we were before. 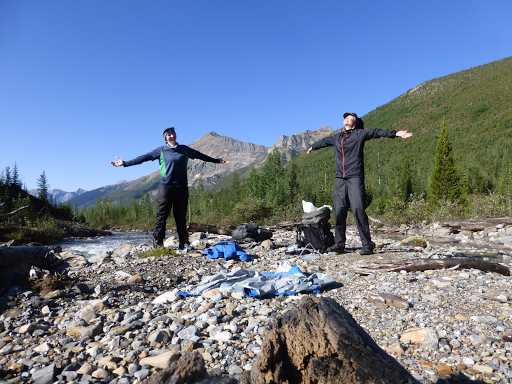 We seriously needed to dry a bit before moving on since some of our core clothing was wet and our hands were too cold to function. 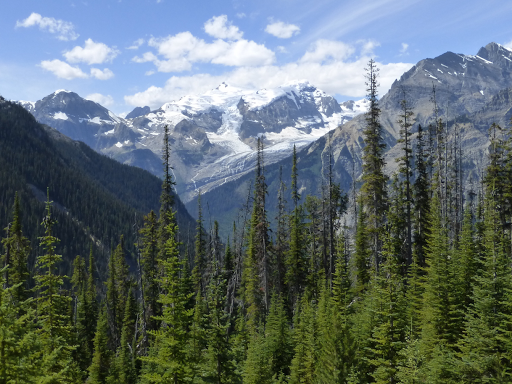 From there, it was a gradual short climb up to the uneventful Amiskwi Pass. There was a slight trail to follow up, but we quickly lost the trail going down. We found ourselves on a densely wooded and wet slope with lots of debris and brush to get through. After a half hour or so, we got down a steep and slick drainage that seemed to lead in the right direction. We knew we were close and just couldn’t find any indication of a trail. I made a joke about standing where I bet no human had ever stood and when I took five steps to search for the trail, I walked right into pink flagging for the trail. We were apparently on some path after all! It cracks me up how those flags show up out of nowhere like that. We never really found a trail, but we did use the GPS track to get us to the intersection we needed. 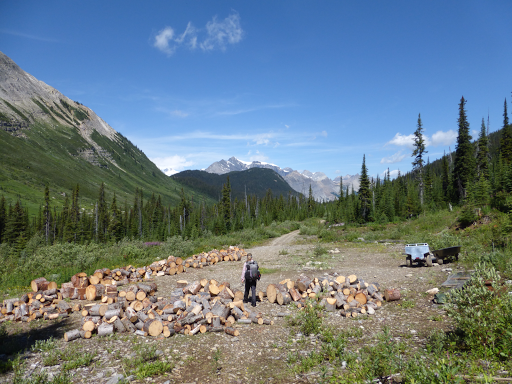 Once we got going, we hit a dirt road with piles of firewood for a lodge nearby. That dirt road m would be our trail for the rest of the day (15mi/24km) and we welcomed the cruising with open arms. 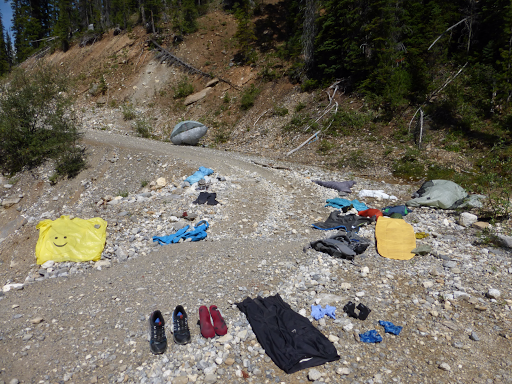 We stopped for lunch on the road and dried just about everything we owned as it had all gotten pretty damp last night. The road gradually descended to a bridge and continued along the Blaeberry River. 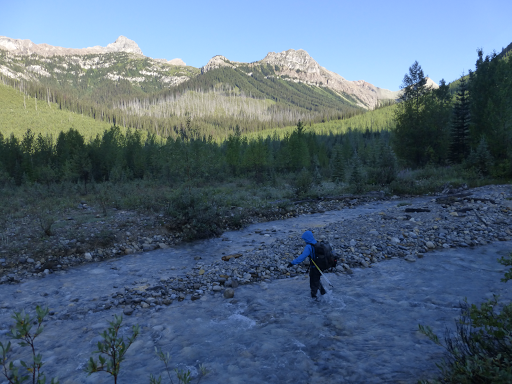 We knew we had two major stream crossings we wanted to save for the morning, so the water would be lower. About a mile before the first crossing, we were looking to camp and pickings weren’t stellar along the road. 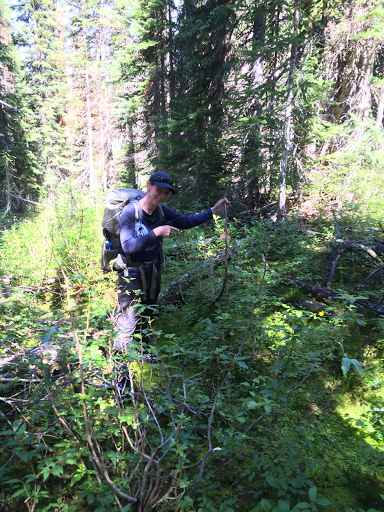 I pointed out a somewhat flat spot and E noticed a trail leading into the woods and toward the Blaeberry…to a perfect camp spot! A great end to the day! We stopped to camp at 6:45pm. As a bonus, we celebrated having dry things…especially dry shoes for the first time in quite awhile! Hard to believe how comfortable we were given how the day started. We also acknowledged that we didn’t see anyone else all day. We are well ahead of schedule for this leg already and buffered in time not knowing how slow going certain parts would be. This is just a notoriously slow section and tomorrow is the heart of it with major steam crossings and hundreds of downed trees. Oh boy!